On balance this 1996 setpart of a series of lush, slightly unpractically packaged reissues on the German Winter & Winter labelis neither the most spontaneous nor always the most profound. Technical accomplishment it does have in spades, however. Herbie Hancock's music was a focus of Toys and the recording has been out of print for a while. 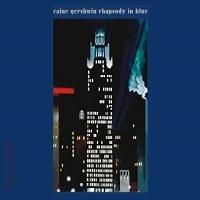 Pianist Uri Caine's reference to other composers, finding inspiration in phrases or longer compositional units, is pretty much a matter of public record. Other people have kept quiet about such relationships while carrying them on very legitimately and to real profit. The important thing is what they amount to, and here, for instance, "Time Will Tell" is a remarkable Latin jazz performance, distinctive mostly for chops and ensemble perfection. Dave Douglas' mariachi trumpet really burns over the complex unity of Caine, bassist Dave Holland, drummer Ralph Peterson and percussionist Don Alias. This terrific chart could be made even more of by the Lincoln Center Latin Jazz Orchestra. Hancock's "The Prisoner" has a stunning arranged opening, a prelude, a flaring passage of Douglas's trumpet, an ironic four-horn take on a symphonic transition, and a powerful, gracefully dynamic drum solo. And then there's an ensemble theme statement and a decent tenor solo, all with such magnificent support from Peterson's drums and Holland's bass thrusts, which might have intimidated lesser soloists. The absence of Don Alias from this track makes sense: there was nothing any extra percussionist could have done. It's a remarkably complete performance. Rare taste and judgment, and ye gods, but Holland swings! At the same time, while Caine also swings, this set involves him in a huge expenditure of energy because of something predictable in his improvising method. The complete stop after his solo on "The Prisoner," with a further surprise in the restart, is a brilliant idea with impressive band contributions, including Douglas's solo, and an excellent composed reprise. 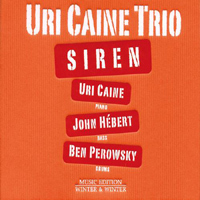 The ballad "Herbal Blue," for trio, has stunning contributions from Holland and Peterson, though Caine's tender playing is not quite in their class. Likewise, on "Or Truth?," Caine's nursery-rhyme figures and standard right hand runs feel slightly hackneyed, even derivative. Hancock's "Canteloupe Island," later in the set, is better, with Don Byron making his bass clarinet sometimes shout and squawk, and generally buzz nicely. Caine's piano comes nearer to what could be done using elbows and knees, loosening and freshening up in a set that's never short on detailed attention. On Hancock's "Toys" the tenorist plays with real freshness, Douglas is reliable at his wonted high level, and Josh Roseman does no harm to his reputation as a trombonist worth hearing. Fine too is "Woodpecker," with Don Alias added to the piano-bass-drums trio, clip-clopping behind Holland. On "I'm Meshugah" it's Douglas with the trio, on a send-up involving trad jazz and European concert music. Witty and clever, but how much more? That's the question. The black card packaging is a classy sophisticated product with physical limitations. Of course, this set's main limitation has been its unavailability! Track Listing: Time Will Tell; The Prisoner; Herbal Blue; Or Truth? ; Yellow Stars in Heaven; Over & Out; Dolphin Dance; Toys; Cantaloupe Island; Woodpecker; I'm Meshugah for My Sugah (And My Sugah's Meshugah for Me). 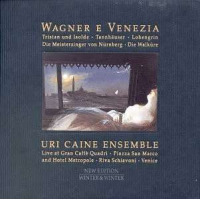 Personnel: Uri Caine: piano; Dave Douglas: trumpet; Don Byron: bass clarinet; Josh Roseman: trombone; Gary Thomas: flute, tenor saxophone; Dave Holland: bass; Ralph Peterson: drums; Don Alias: percussion.